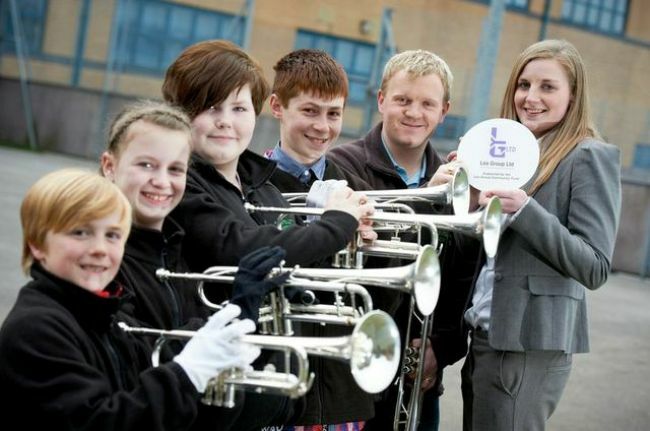 A cash award of £2,000 is music to the years of a Bradford youth band who is helping to get more children from all walks of life to take up an instrument. West Yorkshire-based Leo Group, which is one of the country’s leading recycling and renewable energy companies, has awarded the grant to Queensbury Scout Band as part of its Community Fund scheme. The money will enable the band to buy new instruments for its young scout members. It will pay for ten new trumpets for the band, who train children from the age of eight how to play musical instruments of their choice, even if they don’t have their own. Last year the Leo Group, which operates the Omega Proteins at Thornton, donated more than £125,000 to charities and other good causes across the communities where it is based, including its Bradford and Calderdale heartland. These included Bradford and District Autistic Support Group; Manorlands Sue Ryder Hospice at Oxenhope; and Northowram Cricket Club. “It is an incredibly difficult job choosing which good causes and charities will benefit from our fund – especially in a year where we had a record number of applications. “We really value the Scout movement and all that they do, their core values are very admirable, and their musicians that frequently appear at many public events, including the Queen’s Diamond Jubilee last year, are supremely talented. “We are extremely grateful for the Leo Group grant. Learning to play an instrument can be expensive, and many children and their families can’t afford instruments of their own.